Lawrence Livermore researchers have found that nanocrystalline materials do not necessarily resist radiation effects in nuclear reactors better than currently used materials. As researchers hunt for materials with the ability to withstand prolonged radiation damage, the use of nanostructured materials, with high interfacial area to absorb radiation-induced defects, has been considered as an enabling technology for future reactor designs and longer-lasting reactor components. For years, simulations had shown that nanocrystals would not only absorb radiation damage better than the polycrystalline materials used in nuclear reactors today, but they also would be functional at the elevated temperatures in those reactors. However, earlier research published in Applied Physics Letters by Mukul Kumar and his LLNL colleagues, showed through experiments that nanocrystalline materials have poor stability under the thermal conditions in reactors. And in new research, published in the journal Acta Materialia, Kumar's team, through extensive in-situ high-voltage transmission electron microscopy (TEM), have discovered that the nanocrystalline materials do not survive radiation damage either. 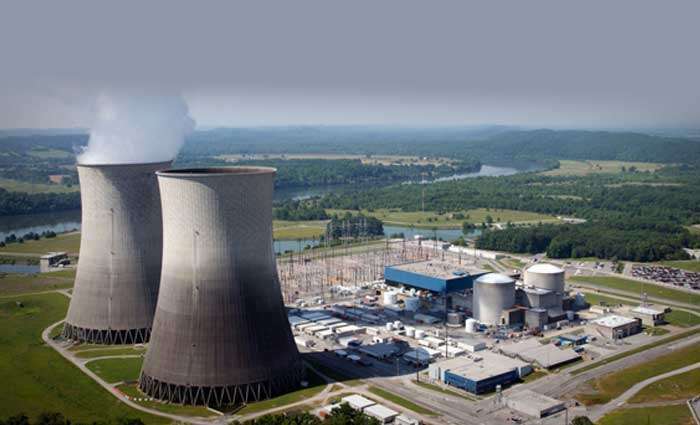 Most structural materials used in nuclear reactors are prone to radiation damage that degrade their mechanical properties and limit their service life. High-energy particle irradiation produces defects in these materials that are mobile at high temperatures and are influenced by stress fields associated with pre-existing extended defects. 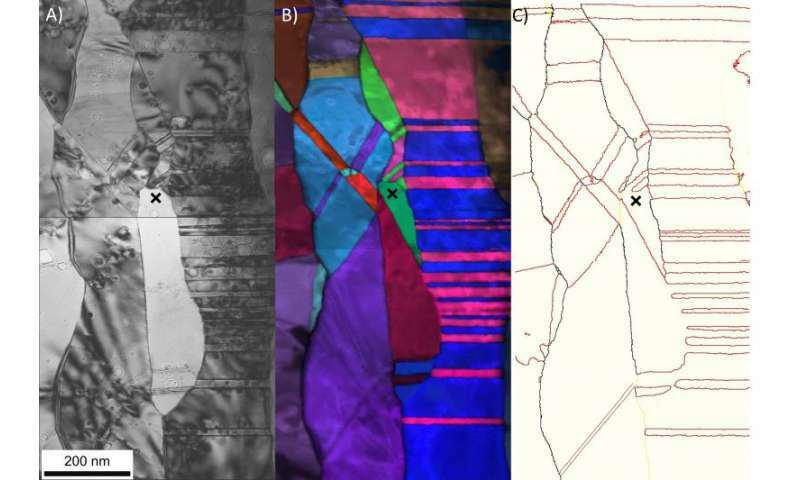 After an initial relaxation phase, the defects that do not recombine aggregate to produce defect clusters or diffuse rapidly to interfaces and other defects, inducing detrimental microstructural evolution. Transmission electron microscopy (TEM) crystallographic analysis shows the accumulation of vacancy clusters and eventual coalescence into voids occurs near low-energy twin boundaries (straight and parallel-sided), where absorption into the grain boundary structure is least likely. Other boundary regions are more or less defect free. Scientists have been searching for years to find new material for components within nuclear reactors that could better withstand high temperatures and radiation damage. Current materials last between four to five years before they are swapped out for new ones. Kumar said initially his team thought the nanostructures, particularly with a high density of low energy interfaces such as twin boundaries thought to arrest thermal coarsening, would be able to extend the lifetime of those components up to 25 years. But the experimental results showed differently. "We've shown why it doesn't work," he said. The team supposed that a high density grain boundary area would act as an effective sink for radiation-induced defects. However, continued absorption of defects can alter the structure of grain boundaries and/or enhance their mobility, eventually leading to microstructural degradation in the form of grain coarsening, thus negating their initial radiation tolerance. The final results showed the nanocrystals did not survive radiation damage any better than the currently used materials. However, Kumar said a new kind of grain boundary network could be engineered in polycrystalline microstructures (with micron-scale grains) that might better withstand high temperatures, resist radiation damage and extend the lifetime of reactor components. Such a network, appropriately coordinated, would comprise of a mix of low energy boundaries to resist thermal coarsening and high-energy boundaries to absorb the defects.